A low fade hair cut has a big number of variations. And in this post, we would like to show you the most trending options. In general, a fade varies from low to mid to high – these cuts are as versatile as your favorite tennis shoes. 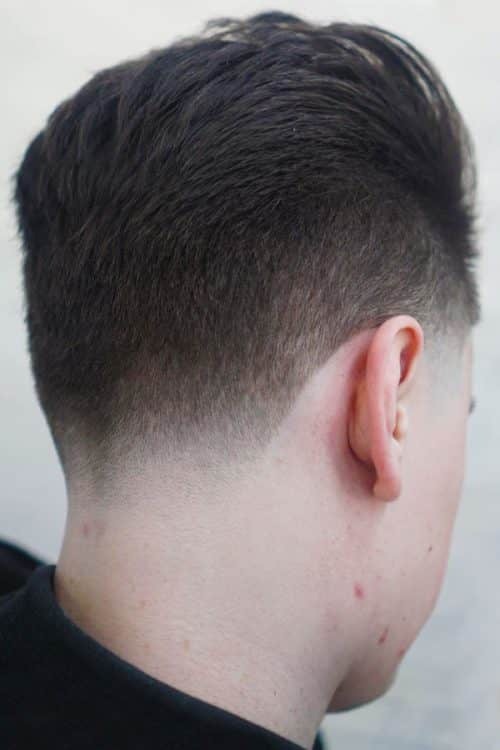 The low fade cut is started above the ear and neckline that’s why it is called «low». 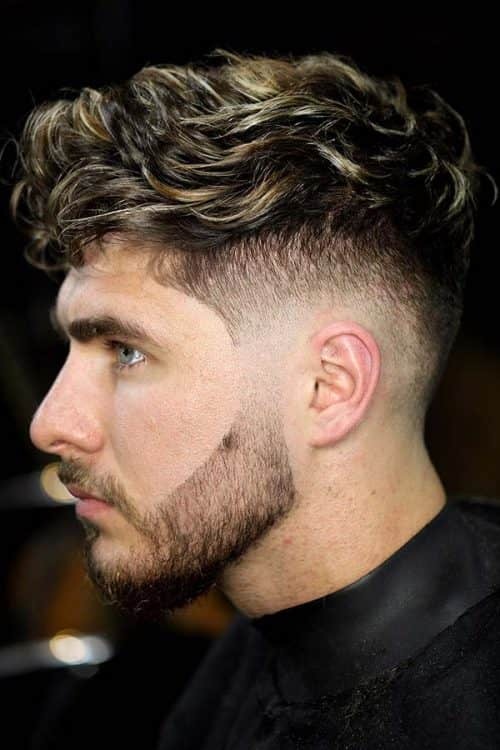 With less contrast and more texture on the sides, low fade haircut are great for medium-length and long hairstyle combinations that require a thicker look. Even though they have a wide range of styles, each style is nearly as easily maintained as the other. Are you ready to pick the new haircut for you? There are a lot of different types of fade haircuts. And as a low-maintenance haircut that requires no styling, almost all the best short sides and long top haircuts require some kind of tapered or faded cuts. So the low fade have a lot of different types, some of which are presented below. No longer is your hairstyle a simple number on the clippers, as seen in the low skin fade. The cuts are more artistic than ever. The low bald fade is the same cut as the low skin fade with one exception. The length of hair at the base of the cut. A skin fade haircut starts out thick and thins out toward the bottom. These cuts are here to stay. If you desire to add contrast to the sides of your cut, then the low drop fade is the perfect cut for you. It also works especially well for the bearded look. A drop fade haircut also looks cool when it is styled in a sleek manner. It is important to recognize that there is a huge difference in a low fade vs taper. Although these two cuts are similar in the way they are cut, they are distinctly different cuts. With that being said, these two cuts can be integrated into each other and create what is called a low taper fade haircut. For a lot of cool men’s hair ideas, let’s take a look at the different haircuts to wear with low fade you can try in 2018. You’ll must to know that low fade haircut work well with short, medium and long hair on top, as well as a variety of textures and hair types. The low fade comb over is a prime example of how important it is that a man’s hair looks fantastic no matter what angle you may be looking at it from. Especially when looking at this hairstyle from the back, the contrast of the comb over low fade provides a clean and interesting look. Here we have another example of the merging of two separate haircuts that create a fresh new look with the low fade undercut. 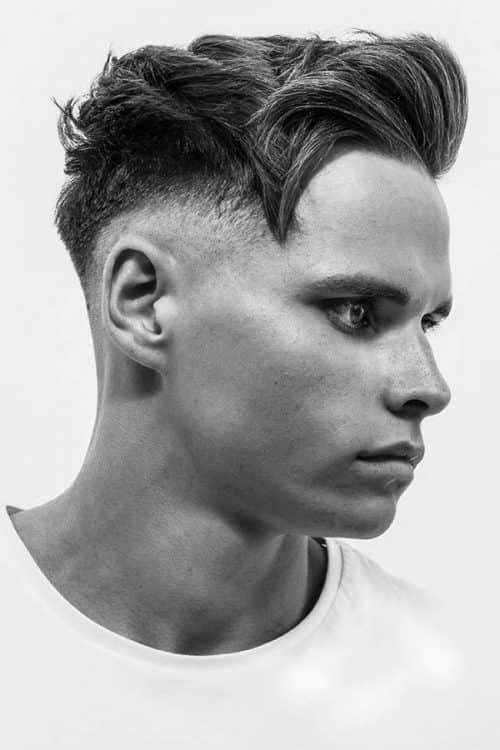 The undercut fade is a unique modern look that has burst onto the scene to provide an additional option in men’s hairstyles. There is a key to obtaining the fade undercut for it to have the proper appearance. The hair should be in three separate sections. The longest part of the skin fade undercut will be on top, the undercut section will be below the crown and fade in around the temples and ears. This provides a clean, well-blended cut that is stunning to look at. Today huge variety which you can try and combine with each other. We offer a selection of the latest trends of hairstyles that you can wear with a low fade haircut. This photo is a gorgeous example of a faux hawk fade. It is a milder version of the Mohawk and looks absolutely amazing with this model’s curly hair. 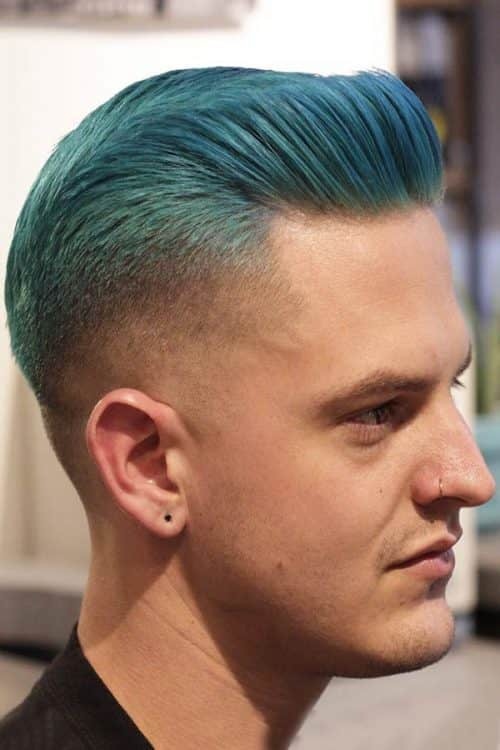 The faux hawk haircut does not have disconnected sides that are shaved. On the contrary, it has a tapered fade that creates the Mohawk style with the length on top. Here we have a classic version of a pompadour fade. A pompadour hairstyle is typically worn in a very sculpted and structured manner. But with the messy hairstyle being a hot new trend, it is possible to wear the hairstyle by adding a low fade to steer clear of a bedhead look. 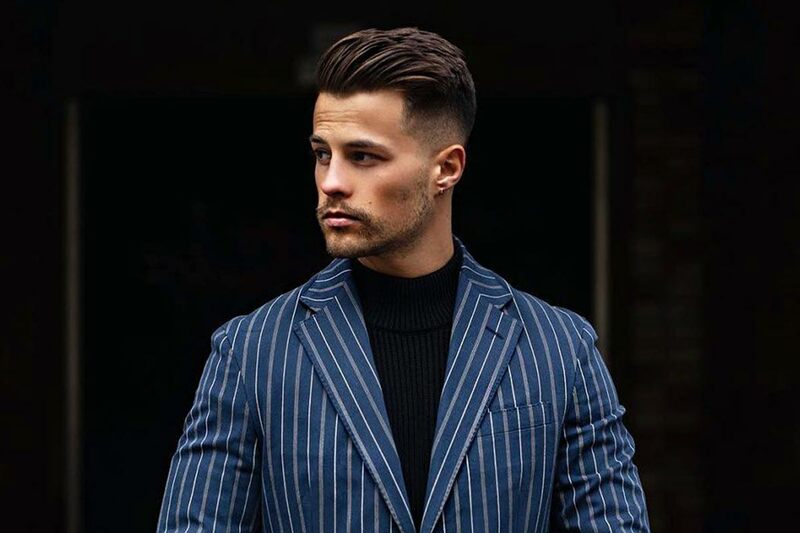 Pompadour hair is notorious for a neat and tidy look, so it is important to keep the sides, and lower portions of the style trimmed to assure the look maintains its sharpness. This hairstyle with a side part fade is a modern look that has sprung onto the scene of the hair industry in the recent years. When coupled with a low fade, side part hairstyles look amazing. It is important to take into consideration your facial shape when obtaining side part hairstyles men desire. Due to the facial shape, you should alter the fade from a low fade to a high fade. 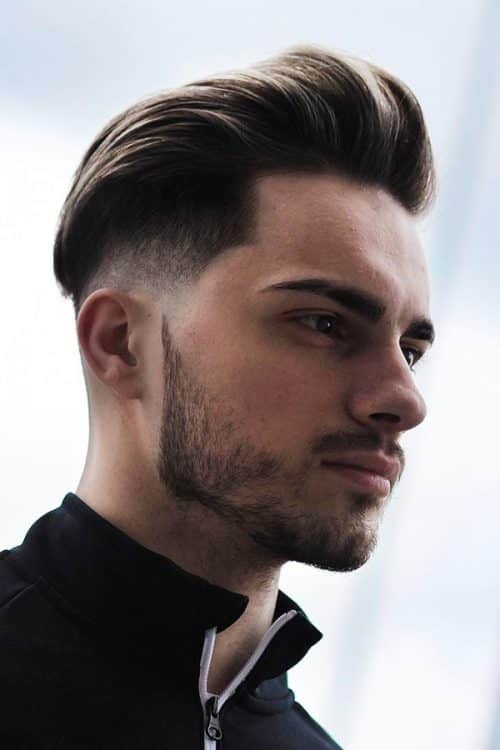 With a men’s side part, a high fade can make a face look more oblong, so it is important to have the sides longer to prevent the style from looking awkward. If you want to achieve the look of slicked back hair, it is vital that you give this classic look a modern upgrade in order to prevent the look from seeming outdated. When you choose to wear your hair slicked back, you can achieve one of the two effects. You will either look modern and dramatic, or you will appear dapper but outdated. 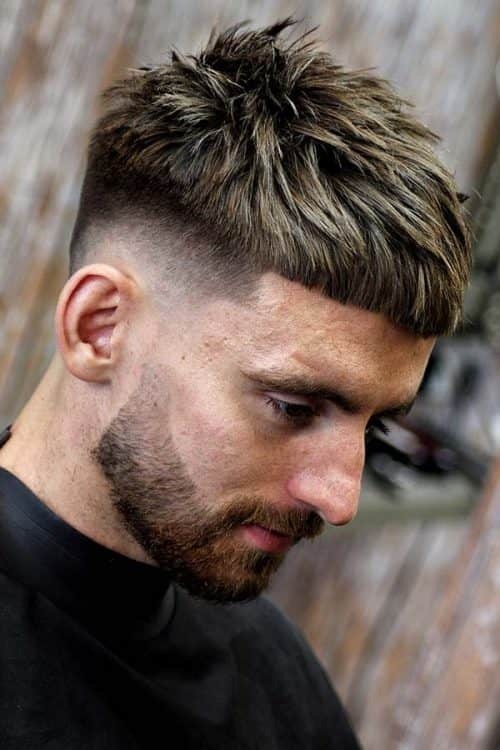 By incorporating a fade into your hairstyle, you will be able to have a contemporary and sophisticated look without seeming as if you were from a different era. If you are seeking a modern and edgy look, the low fade with long hair is an option for you to consider. This cut allows you to rock the man ponytail that is a look that not just any man can pull off. The low fade option integrated into this cut is a great combination with the beard and gives a classy appearance. When applying this look with bearded men ponytail takes on a more macho look than ever before. Another trendy look is a low fade black men tend to prefer this cut to tame their look. 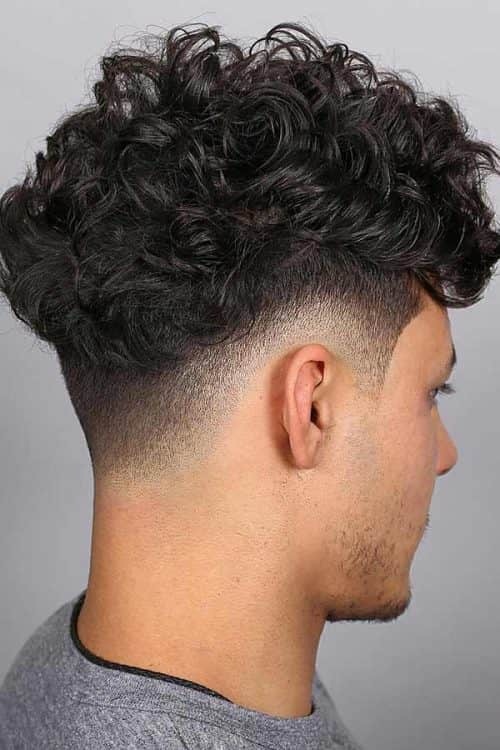 A reason for the selection of the low fade haircut black man prefers is the neat and tight appearance and a chance to still keep some length in his curls. The best option for the low fade haircut black gentlemen wear is to fade down to the skin to create contrast. A low fade has been around for ages and, like most haircuts, tends to evolve with the times. However, its basic structure remains the same. This timeless cut is sure to continue its evolution but will remain at the forefront of men’s styles for decades to come. A low fade is a cut you can always rely upon to give you a clean, classic look that compliments your personality.